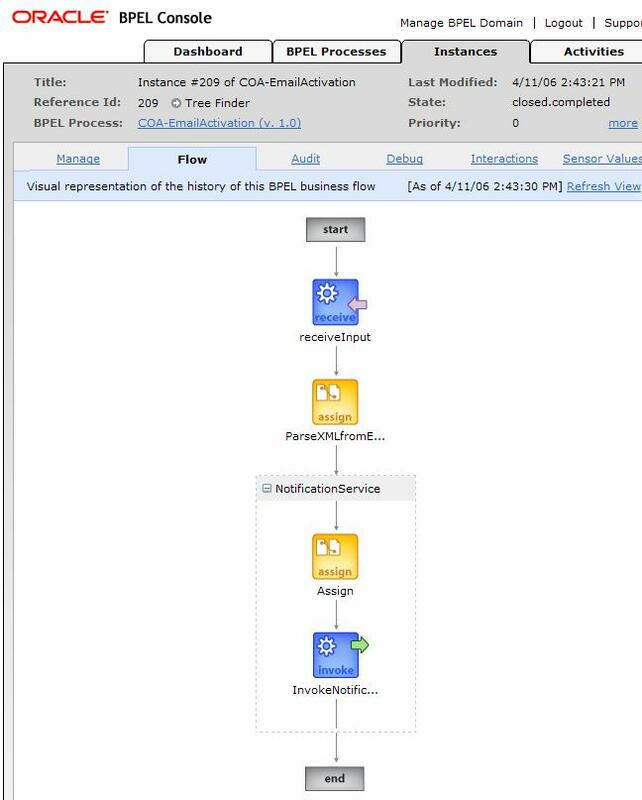 In what is to become a series of articles illustrating a full blown business case for a Conference Registration Processing process implemented using Oracle BPEL PM, this is the third installment, discussing how the BPEL Process Instance can be fired off upon reception of an email. The idea is that the front-office application – a very simplistic website – collects data from the candidate Conference attendee and submits that information by means of an email to a designated mail account. This mail account is to be monitored by the back office – whenever a new email is received, a registration handling process should be started – either by one of our back office staff or by our back office BPEL engine. The latter is obviously the objective of these articles. In the first installments, Generic Service – HTML Form Post to Email Servlet and Implementing a stand alone Email Server – Getting Started with Apache James we have created a very simple Web Site (a static HTML Document) that allows registration of our conference visitors, implemented a generic Servlet that handles an HTML Post and turns it into an email, configured a dedicated Email Server using Apache James and learned how to access that email server using Thunderbird and plain Java code. This article will demonstrate – using the excellent weblog by Matt Wright as well as Chapter 15 in the Oracle BPEL PM Developer’s Guide for release 10.1.2 (see resources for hyperlinks) – how we can implement as BPEL process that is instantiated whenever an email is received into the designated account. The process instance will read the email and act upon its contents. To clearly show that some is happening, the BPEL process instance will conclude by sending an email to the front office email account, informing on the Conference Registration just taken care of. The first four steps have been implemented and discussed in the first two installments in this series (see resources). Step five is generic and described elsewhere (besides, installation is dead easy). Starting with step 6, things become more interesting. Let’s take a detailed look, shall we? Open the BPEL Process Designer. 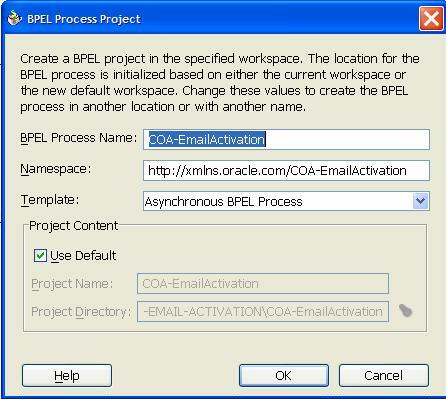 Create a new Application Workspace (COA-EMAIL-ACTIVATON) and a new BPEL Project (COA-EmailActivation) based on an a-synchronous activity. In the default BPEL process created for us, remove the callBackClient Invoke Activity – as we do not need it. 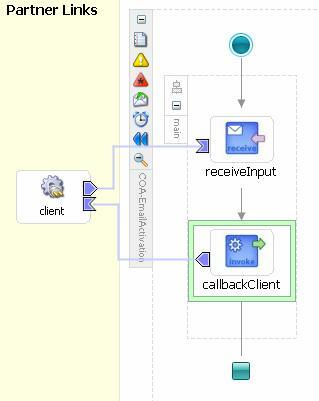 Since we are going to deal with emails in this process, we need to set up the structure of emails through an XSD. 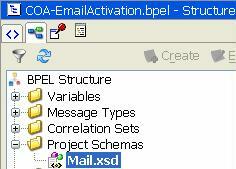 Oracle BPEL ships with a Schema Definition for emails, as this structure is standardized. The XSD is called Mail.xsd and can be found at: http://<host>:<port>/orabpel/xmllib/Mail.xsd where <host> is the server on which your BPEL PM Server is installed and <port> is the port that itâ€™s listening on (on my laptop therefore it is at http://localhost:9700/orabpel/xmllib/Mail.xsd). Enter the url for the Mail.xsd document and click OK. The Type Chooser opens. 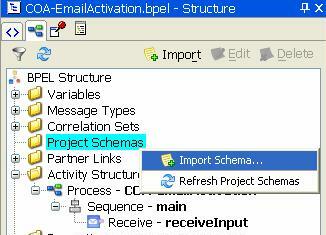 Locate the Mail.xsd schema and select the mailMessage element. 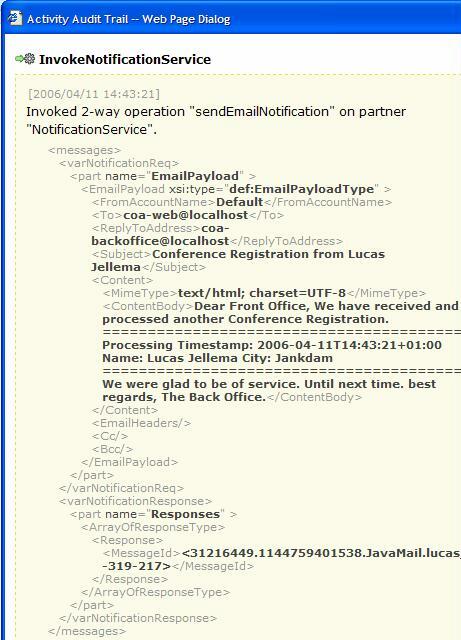 Now we have specified that the payload part of the Request Message is of type mailMessage. We can use this information later on to extract specific pieces of information from the request message variable. 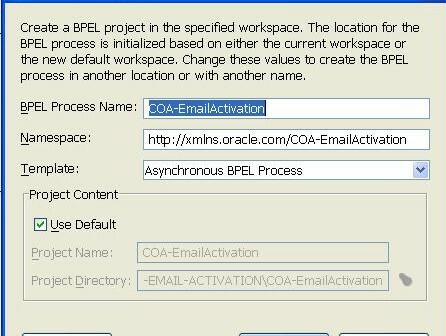 Here we have specified – using the MailActivationAgent, a standard component of Oracle BPEL PM – that every 35 seconds (heartBeatInterval), the BPEL Container should check the coa-backoffice mail account for new emails. Any new email found should trigger the start of a new process instance. 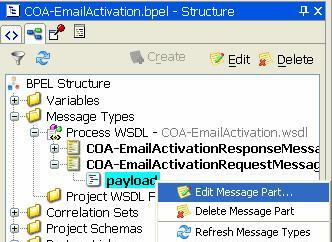 The email message itself is used as payload for the RequestMessage with which the process is started. As was described in a previous installment, I have installed and configured James, the Apache Email server. I have created a few email users or account, including coa-backoffice and coa-web; the passwords are the same as the usernames. James supports the pop3 protocol can be reached at port 110 on my localhost. 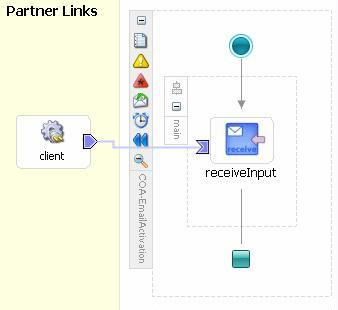 That is where applications such as Thunderbird and also Oracle BPEL PM can read emails for specific useraccounts. 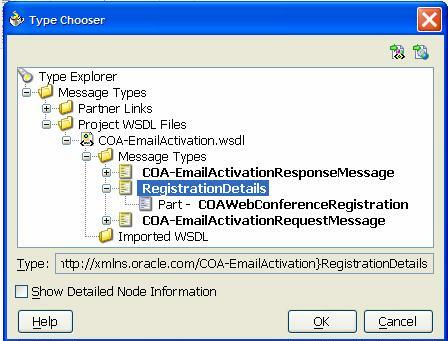 With this configuration file, Oracle BPEL PM knows how to link the Email Activation Agent that was specified in the BPEL process with accountName coa-backoffice to the email account coa-backoffice – their names do not need to be the same by the way, the link is in the name of the file – on port 110 of the localhost. Well, the proof is in the eating so let’s try to deploy this very basic process. Note that very shortly we will flesh out some more interesting aspects of the process. Ensure that the Oracle BPEL PM is up and running. Now we can deploy our BPEL Process to the Oracle BPEL Process Manager. Right click the project, click deploy and select the default domain on the LocalBPELServer. 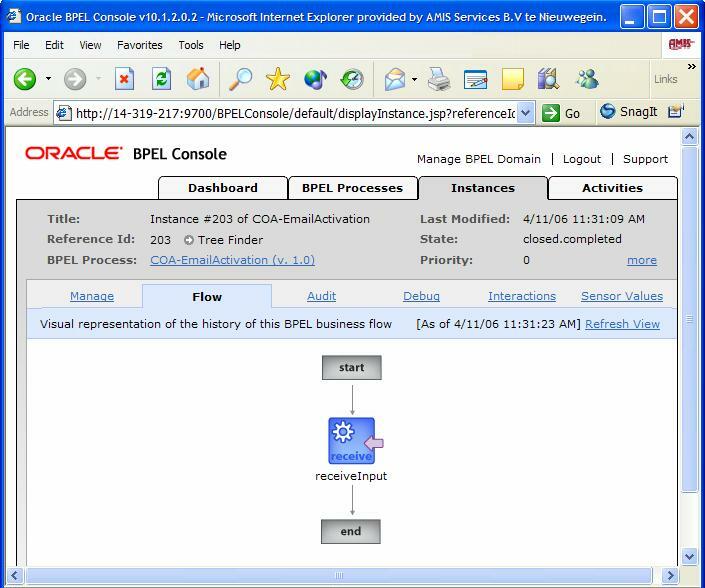 The Oracle BPEL Process Designer starts compiling the project and creates a BPEL suitcase that subsequently is deployed. In order to start a process instance, all we need to do is send an email to the coa-backoffice@localhost account, and it should be picked up by the BPEL Process Manager. After no more than 35 seconds, this email should trigger a BPEL Process instance. If it does not work for you – as it did not for me – the gotcha from Matt’s blog is very very extremely useful (thanks Matt! ): Gotcha!! – If you modify the BPEL process in JDeveloper, the bpel.xml file may lose its changes (i.e. the activationAgent definition), and as a result the process will never get initiated – so always check the bpel.xml file is correctly defined just before deploying the process. 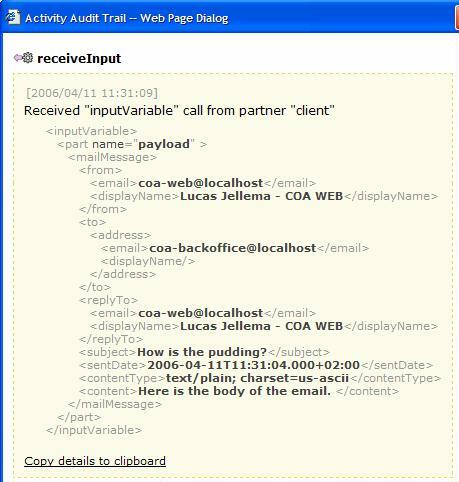 In the Generic Service – HTML Form Post to Email Servlet I introduced a servlet that receives an HTML Form post and turns it into an Email, with all posted Form parameters included in the email body as key,value pairs. Now is a good time to take the next step and have this servlet create XML content in the email. This obviously allows for much easier processing in the BPEL Process. 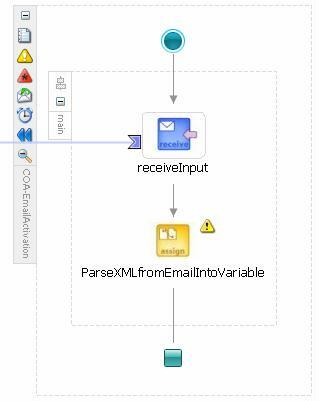 Here we see that the process instance created upon sending the email with XML content takes the XML fragment into the BPEL process. Now we need to take the email content – an unstructured string – and turn it into a structured BPEL Process Variable, XML type. Save the WSDL file. Now we can create a variable in our BPEL process that is based on this type definition and subsequently parse the XML fragment from the Email body into this variable, for further processing. First, let’s create a new variable, called COARegistration. 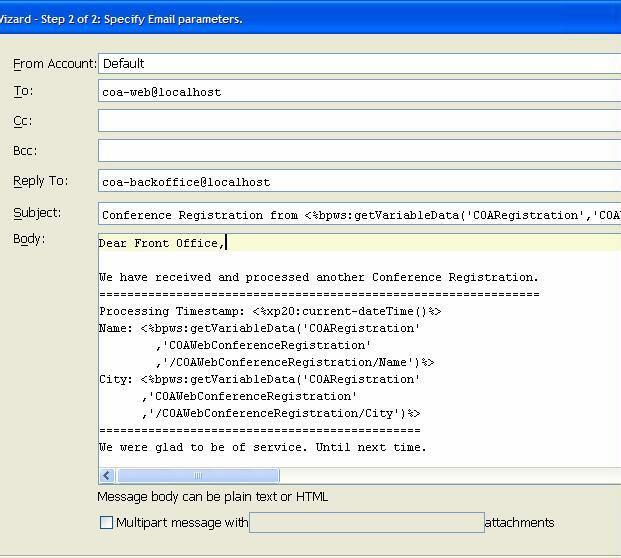 It is based on the RegistrationDetails message(type), and specifically its COAWebConferenceRegistration part. 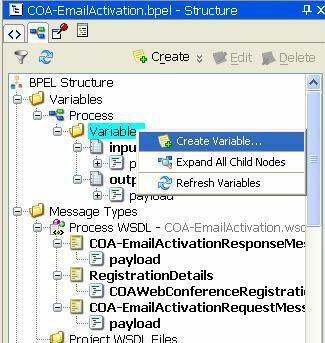 Go to the structure window for the COA-EmailActivation.bpel file. Locate the node Variables. Right click and select Create. Select the radio button Message Type and click on the Browse Types icon. The Type Chooser opens. Select the Registration Details message that we have just created in the project’s WSDL file. The Create Variable window is shown again. Click OK.
Now we make use of this variable: it will provide the structured ConferenceRegistration, parsed from the unstructured “XML” String in the email body. 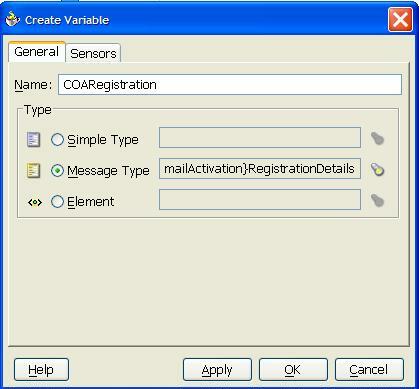 We will create an Assign activity that will copy the parsed as XML content from the email to the COAWebConferenceRegistration part of the COARegistration variable. Key for this operation is the function ora:parseEscapedXML that I found out about more or less accidentally. This function takes a piece of unstructured text (a string) and parses it into a DOM element, that can futher be manipulated. For our purpose, let’s create the Assign Activity, by dragging it from the Component Palet onto the BPEL diagram, just below the receiveInput activity. Now double click on the Assign activity to specify the copy operation. Note how we have retrieved the payload part from the inputVariable, extracted the content element and parsed it into a DOM element, using the ora:parseEscapedXML function. 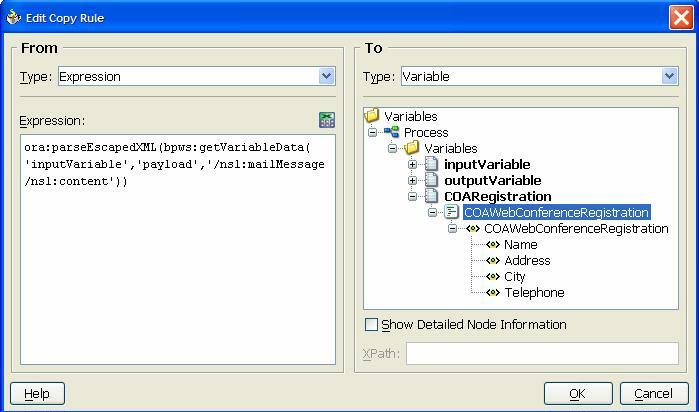 The result of this extract and parse operation is stored in the variable COARegistration’s COAWebConferenceRegistration part. After this assignment, all steps in our process can easily access the Conference Registration details that were initially fed into the process from an unstructured email. This is where the bulk of the process(ing) takes place. Various services are invoked to perform financial checks, calculate the entrance fee, validate address details, add the registree to marketing files etc. However: this part of the process is not yet implemented – as it is not relevant to the story of this article. The last step in our process will be to send an email to the front office (coa-web@localhost), informing on the ConferenceRegistration that was received via email and has now been handled. 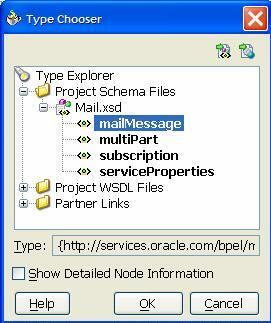 Sending emails is a standard operation in Oracle BPEL PM. We can use the Notification Task. 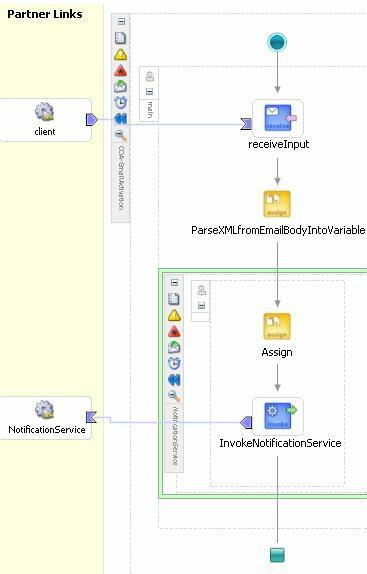 Drag the Notification activity from the component palet and drop it just after the ParseXMLfromEmailIntoVariable activity. The Notification Service Wizard is started. We can choose several communication mechanisms for sending out our notification, including the classic fax and SMS text messages. We select EMail. 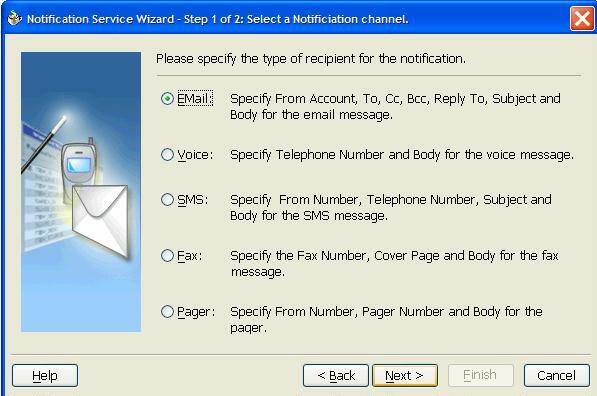 The second step in the wizard has us specifying the destination and origin of the email, the subject and the content of the message to be sent. Note how we can mix plain text content (or HTML for that matter) and data derived from variables. 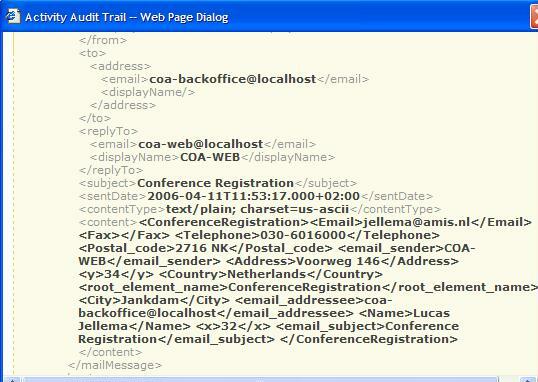 We have cherry picked a few interesting details from the COAWebConferenceRegistration part of the COARegistration variable, for example the Name and City element. For our current purpose – sending emails – is the IncomingServer of no relevance. Time to re-deploy our BPEL process. 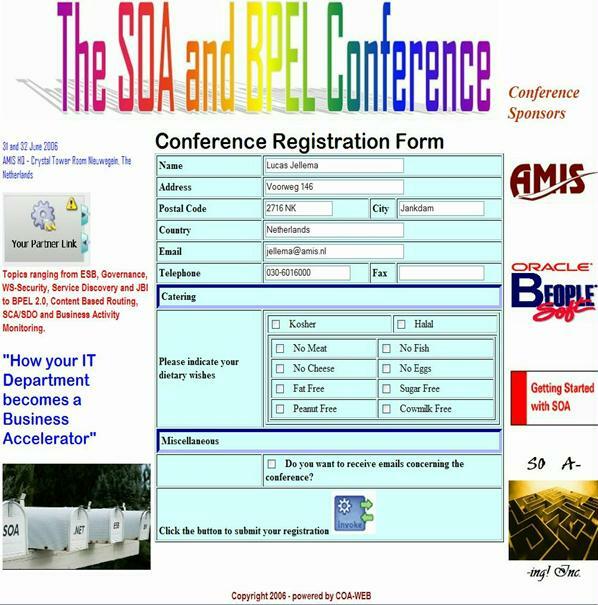 When deployment is complete and successful, we can do another Registration for the Conference on the website. This should cause an email to be sent, a BPEL Process instance to be initiated and eventually another email to be sent to the coa-web account in the front-office. 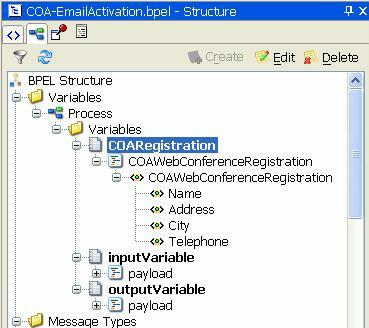 First, the BPEL Console tells us the process was run after we posted the Registration Form on the COA Website. That is very good, although not new. 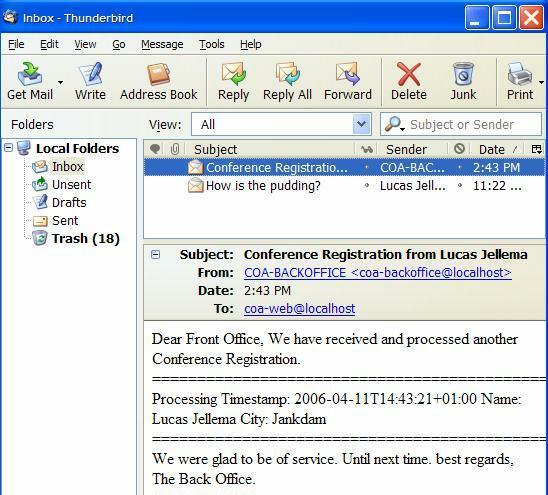 Looking in the Thunderbird Mail Client for the coa-web@localhost account, we find the email that our helpful backoffice has sent us – fully automatically! Oracle BPEL Process Manager – Packt Publishing (October 2005) on CodeGuru: http://www.codeguru.com/cpp/sample_chapter/article.php/c10789__7/ with good descriptions of some important data manipulation functions. Before initiating the process you must have configure the email server. I am pradyumna. I want to invoke a BPEL process when a mail comes to my Gmail Account. I tried all the step that Matt have mentioned in his blog. But whenever mail comes to my gmail account my process will not get Invoked. Following is the incoming server details. Does the nature of the email attachment matter? We seem to be having trouble invoking the process, when setting as its input variable the content of the email . 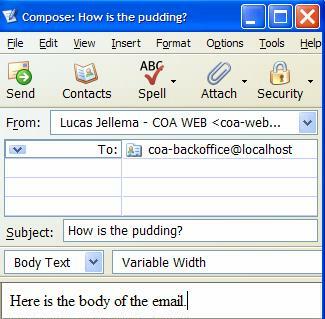 This only happens if the email attachment is in CSV, in which case the attachment is not included. We have tried several mail clients with the same result. The only time it works is if the csv content type is set to “application/octet-stream”. Can you shed some light on this? Can someone please comment on how the development/deployment for this process will change in the SOA Suite version 10.1.3.1? I have just added the BPEL Project file, a zip file with all sources for the BPEL project. Note: this is a Oracle BPEL 10.1.2.0.2 project.